Be more comfortable on your bicycle? Be more powerful and efficient on your bicycle? Overcome physical challenges and injuries that are limiting your riding? A personalized bicycle fitting can accomplish all of these things for you! Century Cycles has Bicycle Fitting specialists in all three stores who are experts at fitting any type of rider on any type or brand of bike. In-depth interview to learn your goals, history and any medical issues or restrictions. Physical body assessment, with particular focus on feet, knees, hips, back, and neck. Range of motion and flexibility tests to determine your body positioning and limitations. On-bike evaluation, starting at the foot/pedal interface and moving up through the kinetic chain making changes to position and components achieve rider goals. Full documentation including before/after photos and positional records. Follow-up session for re-evaluation and any necessary adjustments if needed. Essential Bike Fitting: $175.00 - Available at all three of our stores, this 1-1/2 hour session will accomplish the fitting goals of the casual rider up to the weekend warrior. Complete Bike Fitting: $200.00 (Medina only) - This 2-1/2 - 3 hour session with IBFI certified bike fitter Tom Wiseman provides our most comprehensive fitting and is geared towards serious riders, cyclists rehabbing an injury, or anyone who will benefit from a more in-depth body and foot/pedal interface evaluation. Triathlon or Time Trial Bike Fitting: $250.00 (Medina only) - This 3 hour session with IBFI certified bike fitter Tom Wiseman pays particular attention to the unique demands placed on the competitive cyclist when riding in a triathlon or time trial position. Q. What Fit System do you use? A. 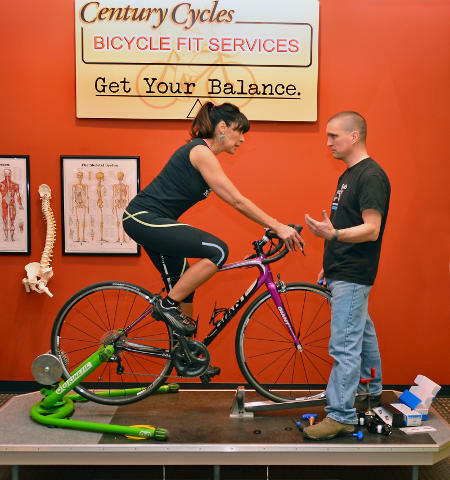 Century Cycles Fitting Services is not based solely on numeric measurements, nor is it based on whiz-bang technology like video or laser scanners. Where lasers and computer-based measurement provide accurate data, they do not take a rider's issues of limitation, whether biomechanical or personal, into account. The fit system we use is based on what the client's body is capable of and what their desires are, not what a set of measurements says is the "best" position. A computer will not tell you where to move the handlebar, cleats, or saddle if the client is still not comfortable. Only an experienced fitter with a critical thinking mind and ear for listening to the client's feedback can do this effectively. Q. What happens during the bicycle fitting process? A. We start with a detailed interview of each client, learning what their history, experience, and goals are that got them here. Part of the interview process is getting to know what medical history or injuries might limit their movement on the bike. A standing assessment is done starting at the feet and working up through the kinetic chain all the way to top of the spine. This is followed by a flexibility and range of motion test to determine what their body is able to achieve on the bike. With this biomechanical information and historical data, we can better understand what position their body will be capable of once on the bike. It is at this point we get the client on the bike and starting at the cleat/pedal interface, move up and down the kinetic chain making adjustments to the bike until the desired outcome is achieved. Q. I know my bike is the right size for me; what would I gain from a bike fitting? A. Bicycles come in only a handful of sizes. When you purchase a new bicycle, we select the correct size for you, and make some basic adjustments, such as the seat height and handlebar height, if possible. This process is referred as a bicycle sizing, but is only the first step. There are myriad other adjustments possible, but a full professional bicycle fitting is the only way to learn your needs to make these adjustments optimal for your physical attributes and riding style. Q. I'm not having any issues on my bike; why should I get a bike fitting? A. If you're not experiencing any pain or numbness on your bike, that's great! However, after a professional bike fitting, there may be some adjustments that will get you even more comfortable, and help you be more efficient. Those "normal" aches and pains that occur on any long ride can be minimized, or even eliminated. There is not a single rider that can't benefit from a proper bike fitting. Cycling injuries (other than crashes) are almost always overuse injuries. Continue in a poor position long enough and it’s not "if" but "when" will injury develop. Q. What should I bring to a fitting session? A. You should bring your bicycle, cycling shorts, and all cycling shoes you use on that bike. A. Call us to schedule an appointment with one our bicycle fitting experts! Medina: 330-722-7119; Peninsula: 330-657-2209; Rocky River: 440-356-5705. Tom Wiseman (Medina) - Tom has been riding, racing, and working on bicycles for over 25 years. He is a USA Cycling certified coach, and has been working in the cycling industry since 1996. He is the first bike fitter in Ohio to be accredited by the International Bike Fitting Institute. Kevin Madzia (Peninsula) - Kevin has been riding bicycles both on the road and off for many years. He has two cross-country bike tours under his belt, races a few times a year, and has been working at Century Cycles since 2004. Dan Ward (Rocky River) - Dan specializes in mountain bike racing, but also trains, competes, and tours on the road. An avid rider for over 40 years, Dan has mountain biked in 15 states, and also runs, swims, camps, and canoes. He is a local trail advocate and a founding member of Ray's Indoor Mountain Bike Park. "I had a full fitting done, and could not be more impressed with the knowledge and thoroughness of the work done. Staff was extremely helpful and informative." "Before and after [...] my bike fitting, the differences are subtle but the effect is dramatic. It turns out my power transfer from feet to pedals was inefficient and that my old sizing wasn't allowing all my legs muscles to fire properly (no wonder I never felt like I was good at spinning!). Tom [in Medina] changed my stem 10 degrees, raised my seat and moved it forward, and spent a lot of time with inserts adjusting my cleats. I felt much better on my ride today (and understood a lot more of how slight position adjustment change the muscles I'm using) and I'm hoping it only gets better. I'm pretty sure it also made me skinnier; don't laugh, the pictures don't lie." "Back in 2001, I had a bad accident on my road bike. From then on, I only felt comfortable riding my mountain bike. Even though I knew I could be faster on my road bike, I rode only my mountain bike all over the place -- roads and trails. Every time I tried to get on my road bike again, it just never felt right. Finally, working with Kevin [in Peninsula], we were able to get my road bike adjusted to fit me right. Now, I'm back in the saddle and love hitting the open road on a proper bicycle."